Today I found out why garlic makes your breath smell bad. There are a few things going on to cause this bad smell, but principally the root cause is various sulfuric compounds from the garlic. Initially, most of the bad breath resulting from eating garlic comes directly from the sulfuric compounds introduced into your mouth. Not only that, but garlic actually promotes the growth of some of the microbes in your mouth that already cause bad breath, which further exacerbates the problem. You may have noticed that even if you brush your teeth, rinse with mouthwash, and other such methods to clean out these compounds and various microbes from your mouth, the bad breath caused by garlic still remains to some extent. This has to do with the fact that some of these sulfuric compounds get metabolized, eventually making their way into your blood stream. The primary smelly culprit here has been found to be allyl methyl sulfide, which is passed into the blood during the digestive process. Once it’s in your blood, it eventually gets passed out of your body through various bodily excretions, which includes being exuded through your pores and also passed into the air that fills your lungs. So as you breathe, the air goes into your lungs and is contaminated by the allyl methyl sulfide; this in turn causes your breath to continue to smell even if you’ve cleaned your mouth out. As mentioned, this sulfuric compound will not only find its way into the air in your lungs, but also will be exuded from your pores. This ends up causing your whole body to smell, not just your breath. As you are excreting this sulfide, you essentially are wearing a stinky perfume. This effect lasts as long as it takes for your body to get rid of the stinky sulfuric compounds, which can be anywhere from a few hours to as much as a day after eating the garlic. 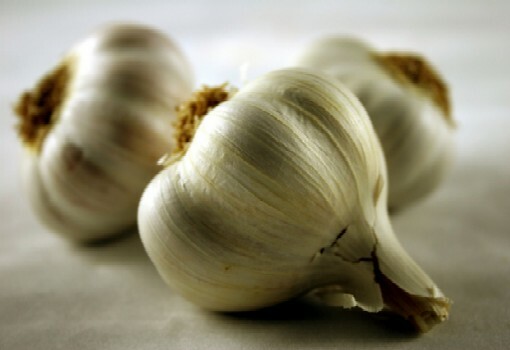 Because of the fact that the smelly sulfuric compounds from the garlic are in your blood, there is little you can do to immediately get rid of the smell from eating garlic, other than to mask it with a stronger smell. However, many people swear by parsley and sprigs for getting rid of garlic breath, which is why particularly parsley is often included in many dishes that contain significant amounts of garlic. Another popular cover up is to drink hot mint tea. Further, drinking milk while eating something garlicky has been shown to reduce bad breath and does an even better job if you drink the milk while the garlicky item is still in your mouth and swish it around. The largest producer of garlic in the world is China, producing about 23 billion pounds of garlic annually, which is about 77% of the world’s supply of garlic. Why does garlic make your breath smell bad? Why does garlic make my breath stink? How can i get rid of garlic breath? SORRY, I didn’t know that garlic STUNK, made you small BAD etc. I don’t think you were properly brought up as where I come from everybody eats garlic daily. I have seldom smelled that pungent odor from family members. The odor is NOT considered bad as you say. The consumption of garlic in Canada has increased 200 fold in the past 40 years with few complaints from acquaintances. Get a life, blow your nose and take a deep breath and enjoy this good for you stuff. Whether garlic smells bad or not is cultural, as well as a matter of personal preference. A much less judgmental way to talk about how garlic smells is to ask what makes it smell so pungent, instead of projecting ones own dislike of the smell into the discussion. Yes, I do smell the garlic on my own breath, as well as on others even after I’ve eaten some myself. I like it. So do many other people. I used to love Garlic and veggies cooked in garlic before. Now my system does not accept garlic anymore. I should stop eating it maybe. I’ve bad breath for almost a day after eating it and i feel uneasy in the stomach and chest area. Thank you Doctor. By the way, where do you get your leaches to remove the toxins? This is a totally gobshite attitude towards garlic! GARLIC IS THE MOST UNSOCIAL FOOD YOU COULD EAT. DANCED WITH GUYS THAT I HAD TO GO AND SIT DOWN, COULD NOT BEAR THE SMELL OF THEIR BREATH IN MY FACE. DISGUSTING STUFF, IT LEAVES YOUR PREMISES REEKING FOR MORE THAN 24 HOURS.